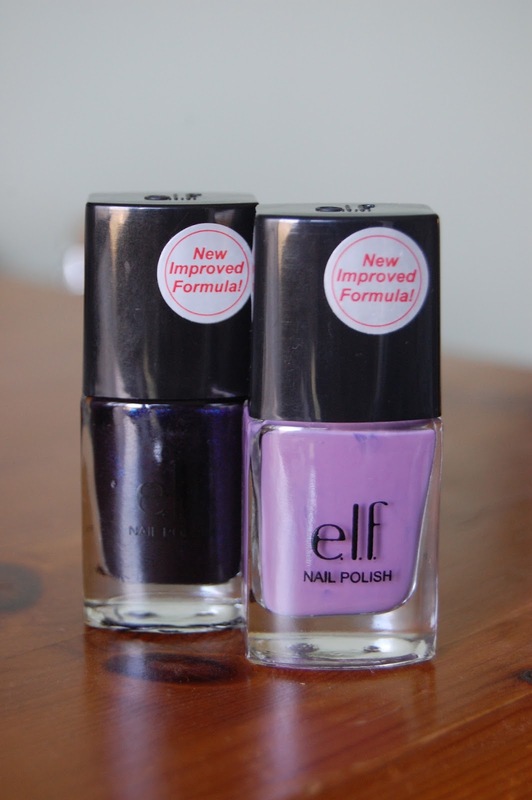 I recently bought some new E.L.F nail polishes. I've bought nail polish from E.L.F before and have been happy especially for how cheap they are! At only £2.50 (Currently £1 in the sale) you can't really complain, especially when you have 55 colours to choose from. The two colours pictured are lilac and dark glitter purple. I've bought the lilac before and felt it was time to get a new one, as my old one had begun to go a bit gloopy as all nail varnishes seem to do over time. I'm a huge fan of pastel colours and anything purple so this is a perfect shade for me. As shown on the bottle the nail polishes have a new improved formula. I'm always a bit dubious when products claim this as most of the time I can't tell the difference, however I could definitely tell this time. The formula is really smooth, easy to apply and has great coverage. Even after one coat it gave a great colour and coverage in comparison to many other nail varnishes I've tried. I was more disappointed with Dark Glitter Purple. It isn't true to the colour which is pictured on the website and isn't anywhere near as glittery as I was hoping, don't be fooled by how glittery it looks in the picture. It was also has no where near as good coverage as the lilac which was also disappointing. When on the nail it appears to be an extremely dark purple, almost black, and the blue flecks of glitter are only visible when you look very closely in the light. Although a bit disappointing, it's still a nice colour which is great for these winter months. I also bought the Chocolate Nail Polish so will do a post on that colour in a few days!